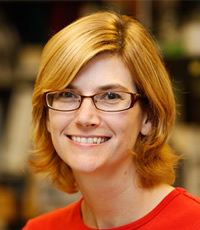 Claremont, Calif. (December 13, 2013)— Associate Professor of Biology Jennifer Armstrong received a $450,000 three-year grant from the National Science Foundation (NSF) to research chromosome structure and gene expression. Armstrong teaches at the W.M. Keck Science Department of Pitzer College, Claremont McKenna College and Scripps College. The grant, “RUI: Chromatin Dynamics and Transcription in Drosophila melanogaster,” will support Armstrong’s ongoing research on the structure of the chromosome and gene expression. The project will use the genetic system of Drosophila melanogaster (the fruit fly) to understand how DNA is managed in the cell and how genes are regulated. Drosophila melanogaster have served as the foundation of genetic and developmental studies for more than a century. The Drosophila genome is used as a model for studies of the human genome, helping scientists design genetic experiments that increase their understanding of aging, neurodegenerative diseases and cancer. The NSF grant will support student summer stipends, supplies to support year-round student research and a full-time research technician who manages the lab, conducts research and assists with student training. During her 10 years in the W.M. Keck Science Department, Armstrong has mentored more than 40 undergraduates, including Pitzer alumnae Janice Cho ’11 and Liana Engie ’11, who both went on to win Fulbright Fellowships. Undergraduate students working with Armstrong on the NSF-funded research will present their work at national conferences. Armstrong has received two previous grants from the NSF to fund her research. In 2003, she won the Pitzer Faculty Research Award for “Chromatin Remodeling and the Histone Code.” She earned her BS in biochemistry from New Mexico State University and her PhD in biology from University of California, San Diego.